Here we go!! My monthly reflection of everything I did, how much I got paid and my successes and struggles as a fairly newish blogger. For those who are new to my income reports, welcome! I’ve been blogging for a year and a half and I am now starting to see results! 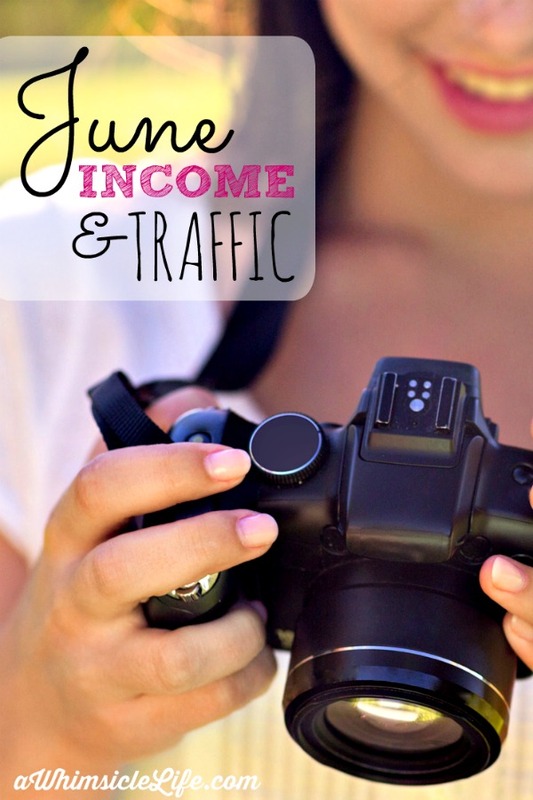 This month will focus on how to grow blog traffic with Pinterest and sponsored posts. I like to get the hardest part out of the way first because then I get to leave you with lots of good news. From my previous traffic reports, you know that I like to plan one big viral post each month. I choose my viral post based on what my audience on Facebook responds to. I noticed that every time I posted someone else’s article about dollar store hacks, it went crazy on my Facebook page. One roundup post (a collection of lots of other bloggers’ work) of kid’s activities from the dollar store had a similar gigantic response. I thought, Yes! This is brilliant! I can create my own activities, publish one each day and then compile them all into one fabulous post that will shared around the internet! Brilliant! Dollar Store Days of Summer was meant to be my big series. I promoted it for two weeks prior to publishing on Facebook by using paid ads. I created a separate email list on Mail Chimp so that new readers could sign up to receive a kids activity every day using only dollar store materials. From that promotion, I gained about 45 new subscribers which was really significant for my then list of 150. When I published, the response was “meh.” The posts are still doing ok on Pinterest. They generate about 30 new visits a day, but that’s as a group of 11 posts. Some perform way better than others which is to be expected. Overall, I’m very happy I did the series. My main takeaway is that my material probably wasn’t original enough. It was too much a rehashing of what other bloggers did before me. I made a huge decision this past month and it has effected my income dramatically. I’ve decided not to take on any more sponsored posts unless I am truly passionate about the product or company. I want to maintain my integrity and while this may seem like a very harsh way to put it, its true. How will anyone believe a word a say if I put my voice behind every product that pays me good money? I’m banking on my lack of income now translating into more integrity and success later on. That said, I am still working with brands. I have a few campaigns coming up (in fact one I am announcing on Monday) that I am SUPER excited about! That’s the level of enthusiasm I want now with every sponsored post I take on. 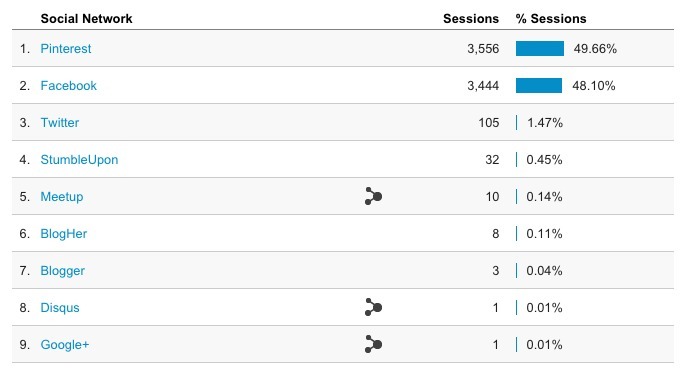 Pinterest brought in a mere 7.2% of my blog traffic. It was pitiful! Each time I had a new post, I published it to one of my Pinterest boards and that’s it. That’s all that was required of Pinterest, right? No, not at all. I was very, VERY wrong. While my Facebook numbers are much higher in May due to a viral post, 30 Affordable Activities for Kids in Phoenix This Summer, the Pinterest numbers are much more sustainable now. While before I was only getting 20 referrals from Pinterest a day, I’m now getting around 170 per day from Pinterest alone. It’s changed my traffic graph from something with high peaks and low valleys to one of rolling hills. I now average around 500 page views a day and that’s not to due to any viral posts. This is huge for me! So what did I do differently with Pinterest? I sought out collaborative boards to expand my Pinterest reach. These boards allowed me to get my content in front of a larger audience. I set up Board Booster to post pins on Pinterest for me. In Board Booster, I created a secret board for every collaborative board I belonged to. I then loaded each secret board with pins for that collaborative board’s subject matter. Board Booster then pins anywhere from 1-3 pins a day for me on each board. It took a little time to set up, but man, is it paying off now! Many of my older posts are getting tons of love because of Pinterest. The breakdown this month isn’t pretty in terms of income. The change in my sponsored post strategy plus my web hosting being due put me in the red. Blogging is all about entrepreneurship. Some things succeed, others do not. A Japanese proverb says, “Fall seven times. Get up eight,” and thats what I’m doing. All I can look for is progress and I’ve seen it this month in traffic growth from Pinterest. Some day, I will have huge numbers to report. JoAnn, I love that you’re so transparent about the decisions bloggers need to make in order to live. As a newbie, I really appreciate your insight and look forward to reading more about our blogger community income (or lack there of). Just for the record, my P&L was about the same. Keep inspiring! Thank you Lizelle! All we can look for in the beginning is improvement 🙂 Keep trucking on as well!